Pearl Imager (Licor) designed for in vivo imaging in the near-infrared (NIR) spectral region. IVIS 200 Xenogen for Bioluminescence based Optical Imaging (c/o University of Torino). Explore Optix (GE) for NIR fluorescence Optical Imaging (c/o CBM, Trieste). 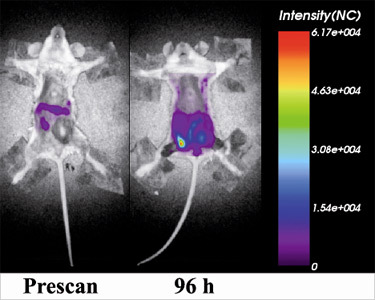 OI contrast agents experimental for preclinical imaging are available. If necessary, labelling and/or smart probes are prepared on request. The activities include the set up of the service/instrumentation/animal models for OI. 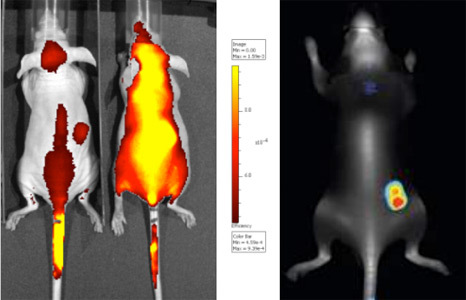 Activities on three OI equipments allowing functional imaging experiments in mice and rats. Labelling of antibodies , proteins and chemicals. Imaging of receptor-targeted fluorophore agents, blood pool imaging agents, smart probes. Biodistribution and pharmacokinetics of fluorophore labelled compounds. Stem cell labelling and tracking. Oncology -> Imaging on Transgenic and Xenografts models (tumor biology, apoptosis , angiogenesis, drug efficacy evaluation).